Every public swimming pool or hotel pool will be mandated to offer an accessible lift or ramp for people with disabilities. The date was set for March 15th 2012 as the deadline, but it has recently been extended for sixty days by the Department of Justice because the demand for lifts or ramps exceeds the availability. Soon enough, all hotel and public facilities, such as recreational centers and health clubs, will be required to have handicapped-accessible pools. 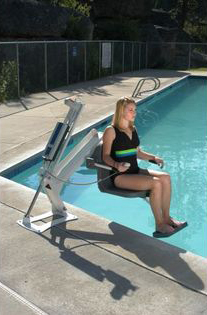 According to the Americans with Disabilities Act, the ramps or lifts are required to be permanently affixed- not portable, and must be at every indoor and outdoor swimming pool. If facilities fail to meet these requirements, they could potentially be fined up to $55,000 or even more. With summer just around the corner, this will be a great addition to all public indoor and outdoor swimming pools for everyone!